The program is open to sophomores, juniors, and seniors in good academic standing at their home institution. Two semesters of college-level Italian constitute the prerequisite for the fall semester, and three semesters of college-level Italian for the spring. A “B” average in Italian language courses is required. Students with less than four semesters of college-level Italian are required to attend the August session in Lecce, in the Puglia region. This course is a three-week intensive review of grammar and an introduction to contemporary Italy, and is required of students with only one year of college-level Italian. Students with two full years of college-level Italian may be exempted from the Lecce session. Participants are subject to specific requirements laid down by their home institution for study abroad. 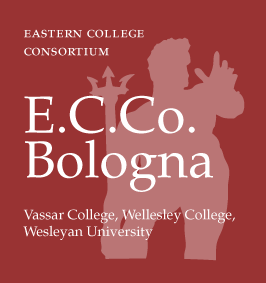 Distinct from other programs in Bologna, the tuition for the E.C.Co. Program for the semester, decided in February of the preceding year, is virtually all-inclusive. The E.C.Co. program, in addition, organizes group travel from the United States to Bologna (and return) at cost. If students do not take the group flight, they do not pay for it. They are expected to communicate all travel plans to the Resident Director as well as to the office staff in Bologna. For further information, students from Vassar College, Wellesley College, and Wesleyan University should contact their respective study abroad offices.